So last year, I gave our bathroom a $100 makeover to freshen up the space, and give us some time before did a few bigger updates. Well, the time has come, and it was a little sooner than we expected. See that crack there? 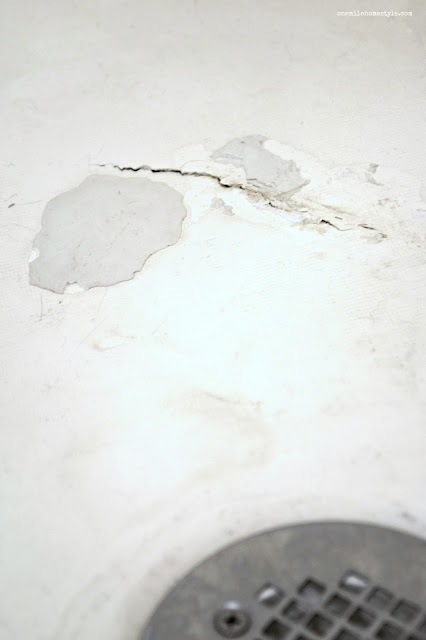 Yeah, that is the base of the fiberglass shower insert in our master bathroom. Ugh! Now that we have been in our house for more than 5 years, it's time for things to start wearing out and needing updated or replaced. We have the pleasure of uncovering new things the builder didn't do so well, and this shower in one of them. You see, generally you would have a fiberglass shower base sitting on something to be supported, ours just has the framing around the edges holding it. So, it flexed when we used it, and one morning it decided it had enough, which leaves us where we are now. All four of us sharing one shower, at least the rest of the bathroom is functional, right?! The other issue has really been a problem since we moved in. 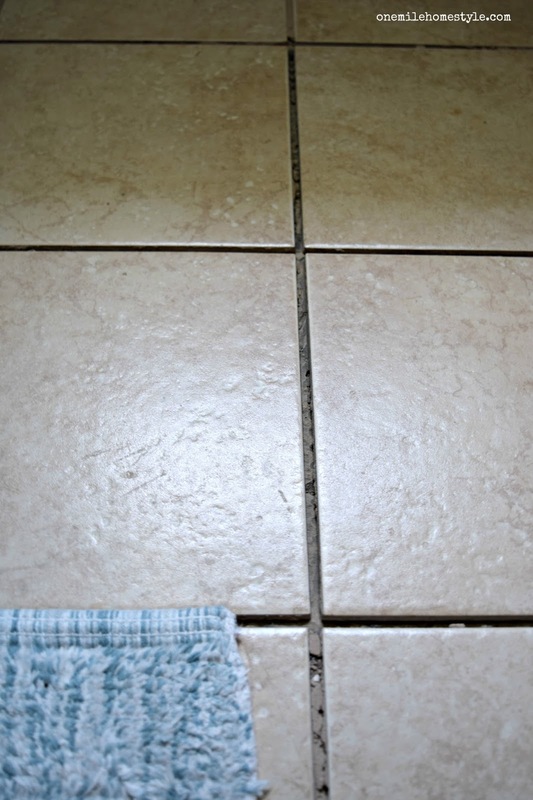 The tile was not laid right in any of the rooms it is in, so the tiles come loose from the subfloor, that cracks the grout, and you end up with a floor that look like this. We have relaid some the tiles in the kitchen that are doing this, but it's just a temporary fix until we can remove all the tile and subfloor and install something new. On a positive note, I'm pretty sure removing the tile floor in this room is going to be a piece of cake, I think I can pull up almost of the tiles with my bare hands. 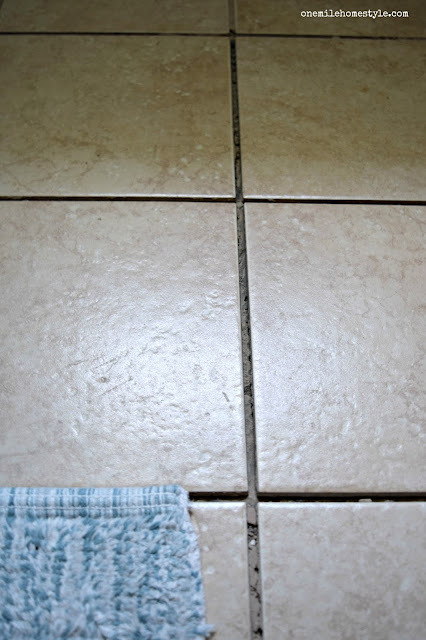 Due to the fact that the shower and floor both were done so poorly the first time, we decided to hire out the task of installing the new tiled shower, and vinyl flooring. 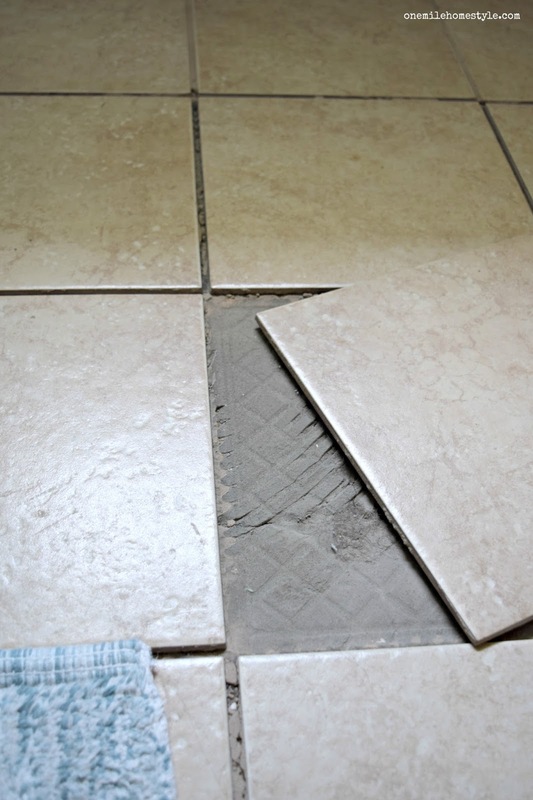 I am so over tile floors at this point, thanks to the builder, I don't think I will ever voluntarily choose tile as a flooring option (at least not in the near future). Be sure to keep an eye on instagram in the upcoming week for lots of sneak peeks and behind the scenes updates! !